Container ships are huge polluters–it’s hard to make thousands of tons of slow moving steel cut through the oceans efficiently, after all. But now entering the harbor are new vessels that can carry 16% more cargo, while releasing 20% less CO2. Container ships are huge polluters–it’s hard to make thousands of tons of slow moving steel cut through the oceans efficiently without spewing pollutants. Nevertheless, Daewoo is building new Triple-E ships that can carry 16% more cargo, while releasing 20% less CO2. It’s often overlooked in these high-tech times, but cargo shipping is one of the world’s most polluting industries. The actual figures are disputed, but one estimate suggests the pollution output of a single ship may be as much as the equivalent of 50 million cars, and it’s possible shipping is responsible for up to 4% of all climate-change emissions. Improving these figures is therefore critical to reducing environmental damage caused by the industry, which is where Daewoo Shipbuilding and Marine Engineering comes in. 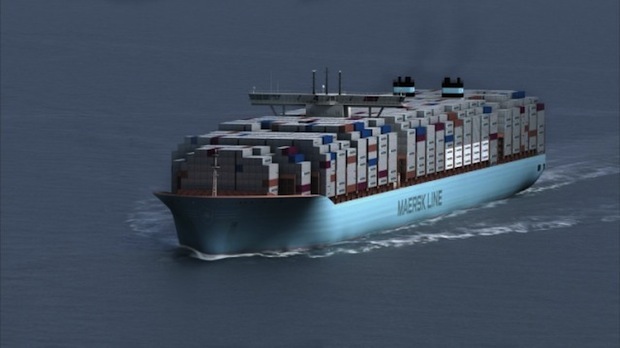 The two outfits are combining on what they call a Triple-E cargo ship design–and 10 of them were ordered by Danish firm Maersk this week. How do they do it? Science and engineering, naturally. The Triple-E stands for economy of scale, energy efficiency and environmentally improved–and this pretty neatly sums-up the ship’s design. To achieve an economy of scale, the vessels are designed to carry more shipping containers than their peers–18,000 20-foot container units, which is 2,500 more than the next biggest efficient ship. To do this with a footprint that’s just a few meters longer and wider (so the vessels can tackle the same waterways and docking facilities as their competition) the ships have a U-shaped profile–which is actually less hydrodynamically efficient than traditional V-shaped hulls. To compensate for this, the Triple-Es have two engines that run slower than usual, driving two smaller propellers with fewer blades–a design that actually reduces drag, and pushes the engine maximum efficiency to a lower speed–requiring up to 20% less power. This translates into better fuel economy. In order to reclaim more energy and reduce the environmental footprint, the ships have a waste heat recovery system that captures energy from exhaust gasses, which can acquire 25% of the energy that’s normally just vented into the sky by cargo ships. In total, it’s expected the ships will emit 20% less CO2 than their next biggest peer design, and 50% less than the average vessel on the Asia-Europe run. This is no fuel-cell design, with almost zero-emissions, and it doesn’t even have the eco-kudos of solar panels or a huge wind-assist kite system…but it’s a start. Ten down, just another 3,800-odd cargo polluters left to improve.